For those that may not be keeping score of our favorite ROM developers CyanogenMod, I have been watching for you and I can now say it looks like they have hit a pretty large milestone. 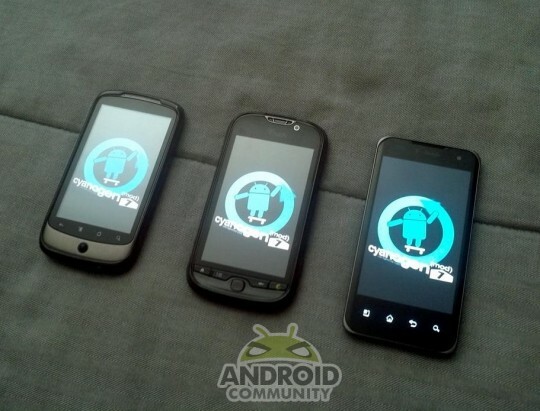 200,000 users running CyanogenMod 7. That is extremely impressive for the guys from TD. This all started back on the G1 and has grown into something larger than any of them had ever expected. This is only for CyanogenMod 7, this doesn’t count users that for some reason may still be on CM6, or even CM5 from the good ol days. From the photo you see above, clearly I am doing my part with the CM7 installs. I have it on all 3 of the devices I still own, not to count the others I’ve sold with CM installed. (Took more than a few tries to get that photo timed right, in case you were wondering). I’d throw it on my iPod Touch if I owned one. My G1 is with a friend or it would be in the lineup, can’t forget the Original G.
Steve (cyanogen himself) and the entire CyanogenMod team probably never imagined it would get as big, or popular as it is today. With over 30 devices supported officially they are as strong as ever and only getting bigger. 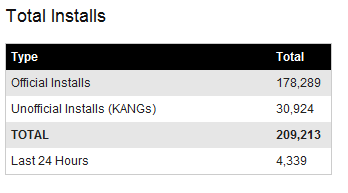 This huge milestone of over 200,000 installs is counting all the official devices, as well as what we call “kangs”. A “kang” is a privately compiled version of CyanogenMod that has been done by someone other than the cyanogenmod team. Users can add, and remove features and compile their own builds, as well as customize them for phones that are not supported like the popular Motorola Cliq, or the Droid Eris. Those are both near the top of the list along with the Thunderbolt for top kangs. One of the lead members @ChrisSoyars has recently been tweeting some of the above information and I just had to comment on it. Check it out yourself at stats.cyanogenmod.com. That shows you the complete breakdown and at the time of writing this they are about to break the 210k mark, and 180,000 official installs. I want to take this moment to say well done guys! You are the best for a reason, and we all appreciate your hard work and long nights put toward CyanogenMod.